Love the color and generous size. Got many compliments! 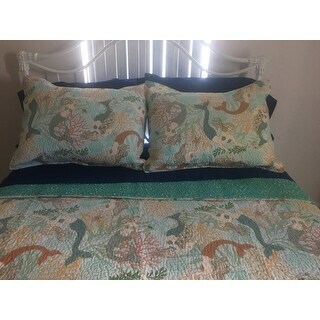 Dance with colorful mermaids and dream of salty seas with the Dancing Waters quilt set. 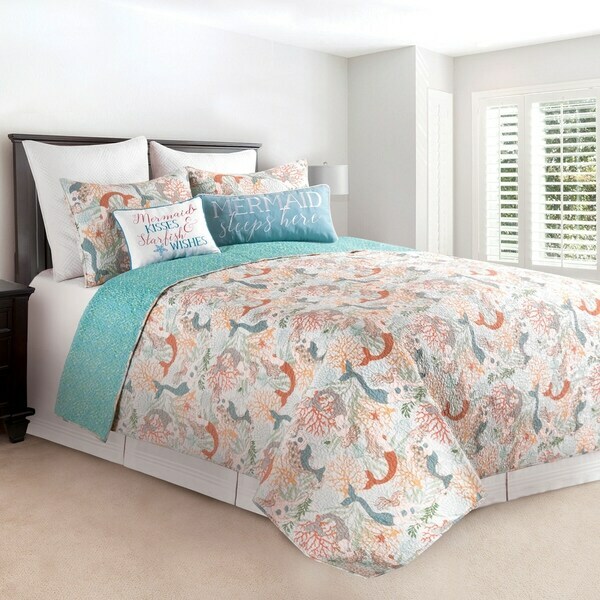 In a whimsical coastal colorway of aquas and corals mermaids drift dreamily among the corals and other aquatic plants. Reverse to a printed wavy pattern in a coordinating aqua, green and white colorway for additional styling options. Crafted of 100-percent cotton the Dancing Waters quilt set is machine washable for easy care. Coordinating accent pillows, euro shams and bed skirt available separately. Love this quilt. Very soft and lightweight. Colors are beautiful and just as displayed. This is a great comforter for a coastal home. Stitching, fabric and construction is quality and easily cleaned in washing machine. Would definitely purchase again. This quilt is so much fun. Love love love it and so does my 6 year old granddaughter. The colors are beautiful and as expected. The colors are beautiful. The picture does not do it justice! Highly recommend this product. I bought four of these for our bunk room. They are so cute! Love the mermaid motif. The reverse is also very cute if you want to fold down the quilt. Product was just as beautiful as pictured! Very well made and delivery was just as promised. Would definitely recommend purchasing. This spread has all the colors I was hoping for - really jazzes up the room. Compliments my room perfectly. It was exactly what I was looking for.